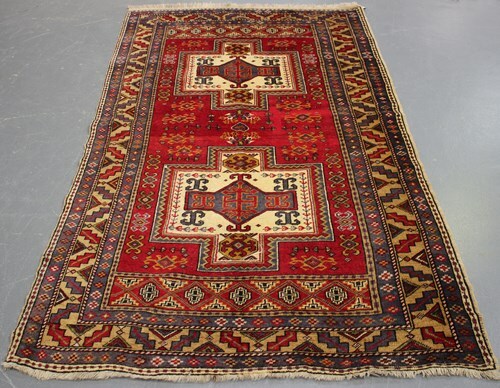 A Caucasian design rug, early/mid-20th century, the red field with two bold ivory medallions, supported by hooked guls, within a serrated leaf border, 251cm x 139cm. 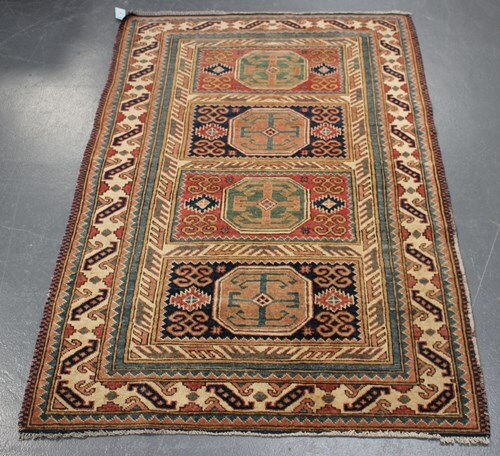 An Afghan Kazak design rug, mid/late 20th century, the compartmentalized field with four polychrome medallions, within an ivory leaf motif border, 151cm x 98cm. 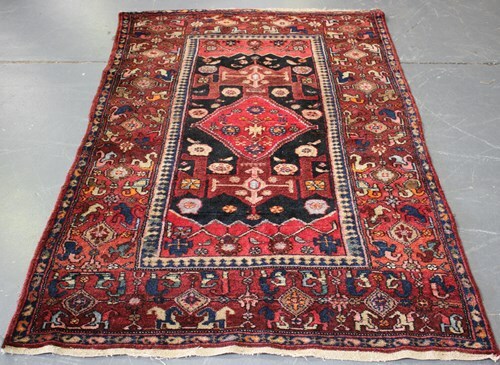 A Hamadan rug, North-west Persia, mid-20th century, the charcoal field with a shaped medallion, within a wide claret border, 200cm x 183cm. 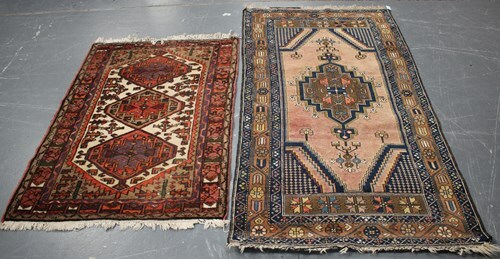 A Hamadan rug, North-west Persia, early 20th century, the faded pink field with a stepped medallion, within a chestnut flowerhead border, 208cm x 106cm, together with another Hamadan rug, 148cm x 101cm. A Kashan carpet, Central Persia, late 20th century, the ivory field with a shaped medallion, profusely supported by flowering scrolls and palmettes, within a wide complimentary border, 300cm x 200cm. 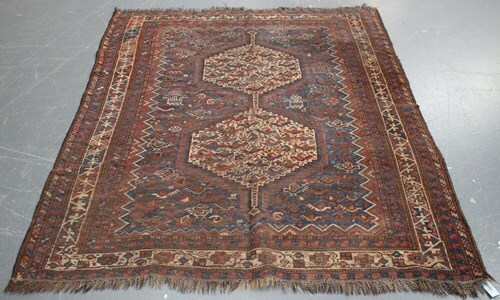 A Shiraz rug, South-west Persia, early 20th century, the ink blue field with a pair of linked medallions, all supported by birds, animals and flowerheads, within an ivory geometric border, 184cm x 158cm. 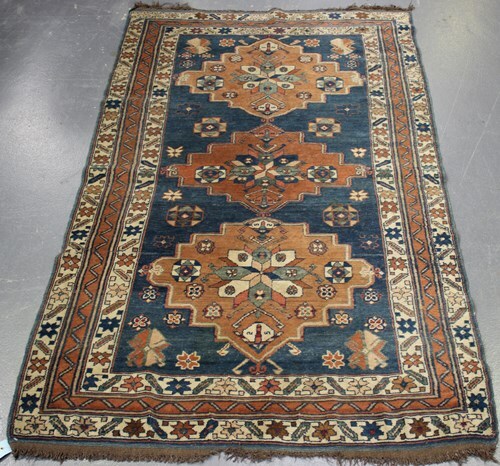 A Turkish Derbend design rug, mid-20th century, the blue field with three stepped medallions, within a flowerhead and vine border, 170cm x 106cm. 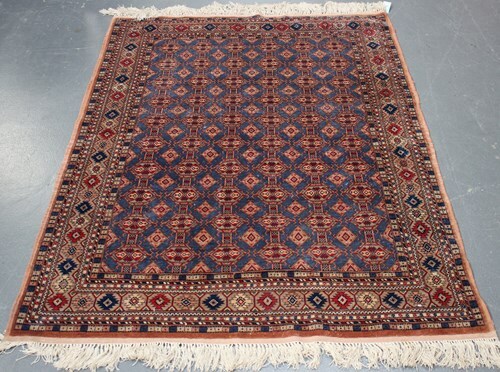 A fine Pakistan rug, late 20th century, the blue field with an overall geometric lattice, within a stepped gul border bearing signature, 172cm x 126cm. 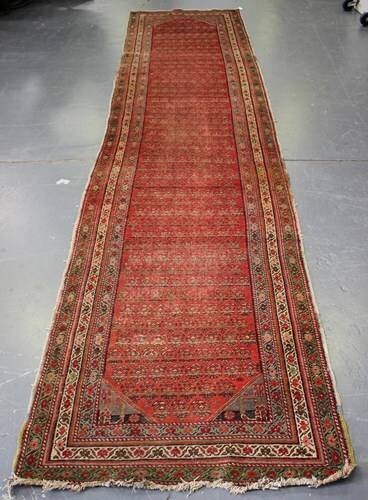 A North-west Persian runner, early 20th century, the red field with overall offset rows of boteh, within an ivory flowering vine border, 428cm x 98cm. A Pakistan rug, late 20th century, the ivory field with overall geometric palmettes and birds, within a polychrome stepped gul border, 167cm x 117cm. 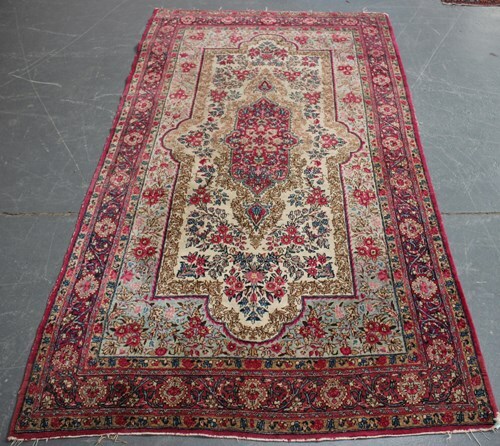 A Mashad carpet, Central Persia, mid-20th century, the claret field with a shaped medallion, supported by flowering tendrils and palmettes, within a midnight blue complimentary border, 303cm x 247cm. 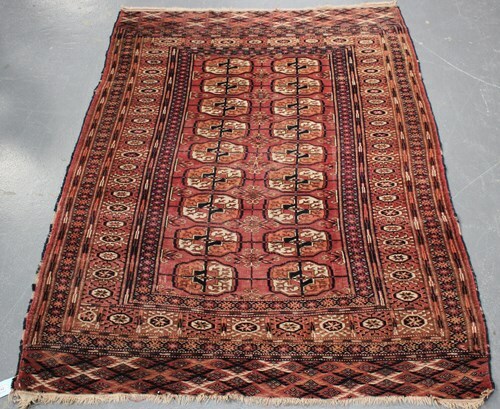 A Pakistan rug, mid-20th century, the red field with offset guls, within a wide multiple striped border, 190cm x 124cm, together with another Pakistan rug, 208cm x 121cm. 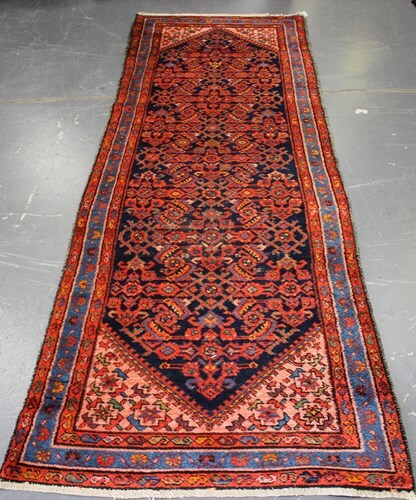 A Hamadan runner, North-west Persia, early 20th century, the ink blue field with an overall geometric lattice, within a blue flowering vine border, 310cm x 103cm. A Tekke rug, West Turkestan, early 20th century, the pale plum field with two columns of guls, within a sunburst gul border, 157cm x 112cm. 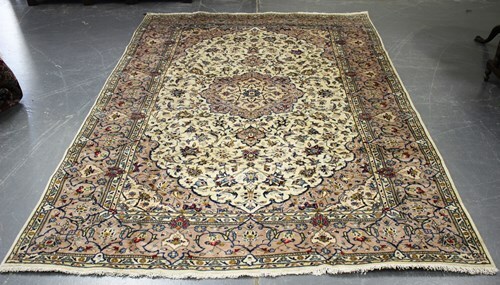 A Kashan carpet, Central Persia, mid/late 20th century, the ivory field with a shaped medallion supported by scrolling tendrils, palmettes and curling leaves, within a wide complimentary border, 392cm x 300cm. 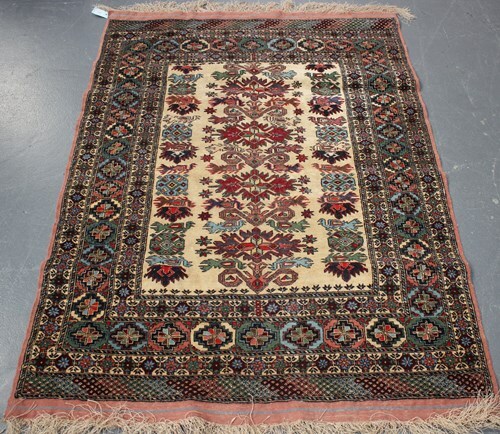 A Kerman rug, Central Persia, early 20th century, the ivory field with a shaped pink medallion, supporting overall floral sprays, within a complimentary border, 234cm x 127cm. 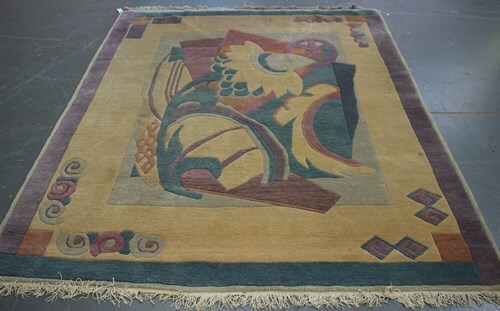 A Tibetan carpet, late 20th century, the contemporary design field within a wide cream border, 246cm x 200cm. 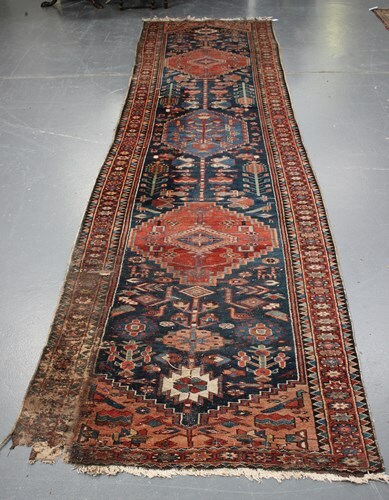 A Hamadan runner, North-west Persia, early 20th century, the ink blue field with three linked medallions, within a terracotta gul border, 415cm x 104cm (substantial faults to one corner). 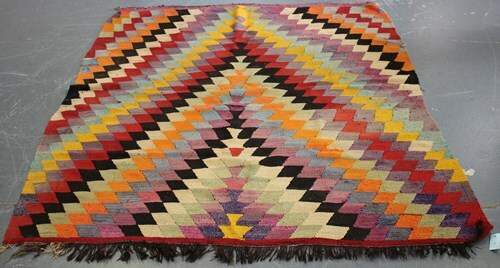 A Turkish kelhim rug, 20th century, with an overall polychrome geometric field, 204cm x 171cm. 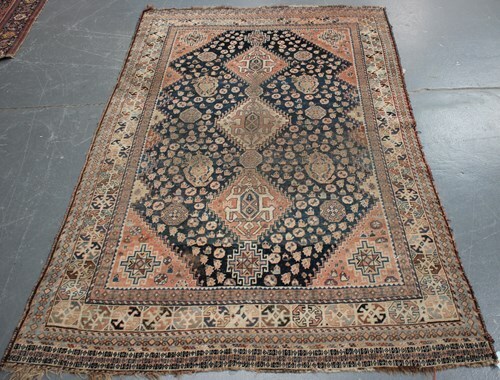 A South-west Persian rug, early 20th century, the midnight blue field with three stepped medallions enclosing turtle palmettes, within an ivory border, 250cm x 148cm.